Mississauga is a city located in Southern Ontario, Canada. The city is situated on the shores of Lake Ontario in the Regional Municipality of Peel, on the west side of the Greater Toronto Area. The forested valley near Mississauga was inhabited by the first nation people many years before European settlers came to the area. The Credit Valley Conservation Authority protects and maintains the valley. Mississauga is a growing city with a diverse cultural background. There has been an increase of 150,000 citizens from the previous decade and the population has doubled in size over the past two decades. The growing size of the community has led to the displacement of wildlife in its surrounding areas. The urbanization of the forests has displaced raccoons, squirrels, bats, birds, and other animals. The density and fast-growing community has also made the iscity an ideal place to find food for urban wildlife. Some urban wildlife move on and find another habitat in the wilderness, but others have chosen to stay and live in attics, walls, garages, sheds, and other parts of homes or buildings. Birds find isolated places to build their nests, while bats live in attics where they breed and hunt for food at night. 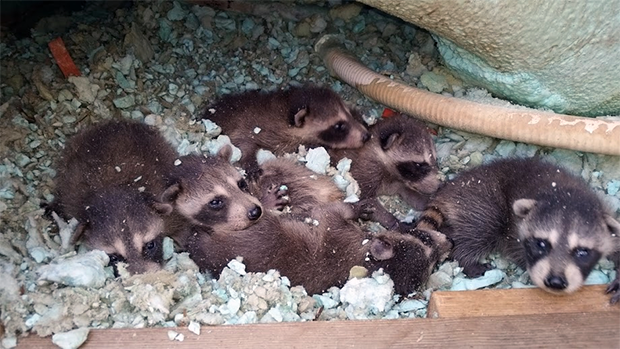 Raccoons invade homes during the winter to find a warm place to raise their young and store their food. Once urban wildlife like bats, birds, and raccoons infiltrate your home or property they can cause damage, spread diseases, and bring all sorts of bacteria and pests with them. If wildlife infestations aren’t dealt with quickly, you are increasing health risks and potential damage to property. Skedaddle Humane Wildlife Control provides Mississauga with animal control and prevention services. The experts at Skedaddle use humane techniques to ensure that wildlife found in your property are safely and effectively removed. Safety is a top priority for us at Skedaddle Humane Wildlife Control. Our team regularly reviews and conducts fall arrest and fall restraint training as well as roof and ladder safety courses. We take every reasonable step to ensure the safety of our employees, and to give our customers the confidence that we’re doing the job the right way. The services performed by the technicians sent to your address humanely remove raccoons, squirrels, birds, and bats from your property and seal any possible entry points. We never use poison, or trap and relocate animals. Our highly trained wildlife technicians know that the most effective way to solve these problems is to identify the wildlife issue and remove the animal(s) by hand, and do prevention work so they cannot return. Wildlife has more than two decades of experience when it comes to handling and removing urban wildlife humanely. If you need to humanely rid your property of bats, birds, raccoons, squirrels, and other urban wildlife, Skedaddle Humane Wildlife Control is the company to call.